This is one of my most popular recipes, with adults and children alike! 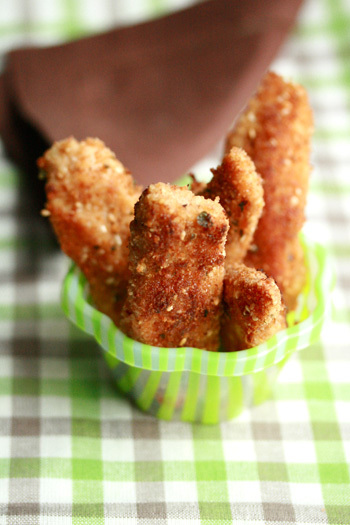 I love the taste of crispy chicken but prefer this version for a healthy everyday meal. I soak my chicken in low-fat buttermilk to tenderize it first, giving it the same tender texture of the deep fried version. If you have a busy schedule, you can soak the chicken overnight and purchase seasoned breadcrumbs instead of making them. Little folk love to eat with their fingers, and this chicken is moist and tender for small mouths! Place the chicken, buttermilk, thyme or rosemary, and garlic into a large zipper lock bag. Tuck the bag inside another zipper lock bag to avoid leaks. Place in refrigerator for four hours or overnight. Set out a large piece of wax paper or aluminum foil on the counter top and place the breadcrumbs, Parmesan, sesame seed, parsley, garlic and onion powder, and black pepper. Mix with your finger tips. Remove the chicken from bag and place in a strainer Discard buttermilk and zipper lock bags. Place the egg whites in a shallow bowl. Dip each chicken piece into the egg then press into the bread crumb mixture. Place the breaded chicken on a plate then refrigerate for at least 30 minutes (this will help the breadcrumbs to adhere to the meat). Heat a large skillet over high heat. Add half of the olive oil and half of the chicken. Reduce the heat to medium and cook 5 to 6 minutes total, turning once or twice so that both sides brown and the chicken is cooked through. Transfer to a plate covered with paper towels and sprinkle with half the salt. Repeat with remaining oil, chicken, and salt. Serve immediately. Nutritional Stats Per Serving (1/4 pound chicken fingers): 449 calories, 35 g protein, 40 g carbohydrates, 15 g fat (3 g saturated), 77 mg cholesterol, 2 g fiber, 673 mg sodium. Only thing to mention: amount of bread crumbs mentioned in the recipe is a bit too much. I’m confused. so cook it in a pan, and how long do you bake it in the oven? Sorry about that Heather- it’s just cooked on the stove top. I edited the recipe 🙂 Thanks for letting me know! I’ve made these several times now and truly love them! Such great flavor! I have found that using grape seed oil (higher smoking point) instead of olive oil helps keep my kitchen from smoking up when I’m cooking the chicken on the stove. I HIGHLY recommend this recipe! Thank you for sharing it! Why do you turn on the oven just to keep the chicken warm as you cook the other batch?